Replies: 8 (Who? ), Viewed: 1476 times. Together with Pleasantview and Veronaville, Strangetown is going to turn 14 years old this year, so I'm honestly not sure if what I'm about to share is actually still useful to anyone. 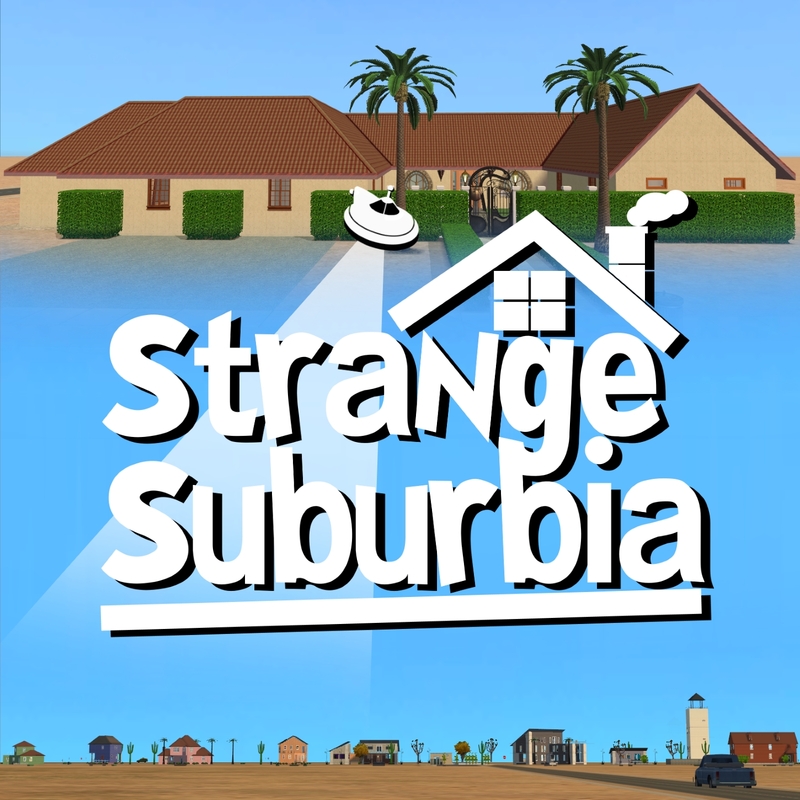 But I'm really passionate about The Sims series as a whole and Strangetown is my favorite neighborhood of all. But I have to admit, that it comes with its faults. The original Strangetown and it's families are amazing and I love playing with them, but very soon the families grow larger and where are their descendants supposed to live? A whole row of houses right onto the highway? It's, well... strange, which I don't mind, but it also doesn't really look that good. So my plan is to expand Strangetown with a few more roads and a bit more Maxis Match housing. And don't worry, my goal is to keep it an isolated settlement in the middle of the desert. I do not plan to make it this huge city or something. Also when I say Maxis Match housing I mean something that looks like it was shipped with the original base game Strangetown. So it will have zero custom content and will be base game compatible (with one exception, but more on that later). My first entry to that project will be 10 Maxis Match houses + a recreation of Espiritu Estate - The haunted mansion that is inhabited by Bella Goth prior to the events leading up to The Sims 2 for the PSP! Some of these house are more curious than the others. And while most these are of my own design, some them are - more or less - based on lots from this fabulous Strangetown recreation for The Sims 3. Just to give credit where credit is due! Right now, these lots are boringly named after numbers from 1 to 10, but when I'll upload them to ModTheSims, this'll hopefully change. When you have a name suggestion for any of these lots feel free to let me know! 1) - §18,773 - 2 Bedrooms, 1 Bathroom - A small starter house for about 4 roommates with a classic green lawn, white picket fence and plastic flamingo combo. Suspicously perfect for the Singles household! 2) - §30,487 - 3 Bedrooms, 1 Bathroom - A cheap house for a small family. Comes with a nursery. 3) - §44,339 - 2 Bedrooms, 2 Bathrooms - Contains a living room with a fireplace and a study that can be easily converted into a extra bedroom. 4) - §39,615 - 2 Bedrooms, 1 Bathroom - Has a big empty garden area to the left and balcony with a bar. 5) - §51,071 - 2 Bedrooms, 2 Bathrooms - Kinda industrial with a semi-open kitchen and a small artsy area upstairs. 6) - §38,032 - 1 Bedroom, 1 Bathroom - A bunker for the Sims that just know that the world ends soon! Comes with an extra room that can easily be converted into another bedroom. 7) - §92,954 - 2 Bedrooms, 3 Bathrooms - A luxurious designer home, that to some Sims is only an ugly concrete building in the middle of nowhere. 8) - §15,189 - 1 Bedroom, 1 Bathroom - A small starter home with a generous front yard, but a lackluster backyard. 9) - §40,574 - 1Bedroom, 2 Bathrooms - An old military watch tower watching out for potential alien attacks. 10) - §55,966 - 5 Bedrooms, 2 Bathrooms - A large family home a lá Grunt. Comes with a nursery! As I mentioned earlier this is the house that Bella Goth lives in after she got abducted by aliens and was brought to Strangetown. Unfortunately the estate is terribly haunted by the ghosts of Dennis Philips and Nervous Subject and when even the maid turned out to be a ghost she had a enough and decided to hide from aliens elsewhere and sells her home to the player. 1) Original PSP Version - As faithfully recreated as possible. Requires University, Nightlife, Seasons and Teen Stlye Stuff. 2) Renovation - Renovated by me to make it look like something that was actually designed for the PC version of The Sims 2. Basegame Compatible! Now I wouldn't post this in the Creator Feedback Forum, if I didn't want any feedback! I posted this here, because I wasn't sure of a few things. I have The Sims 2 Ultimate Collection and used the AnyGameStarter for the UC to make sure I don't accidentally use stuff from expansions or stuff packs, but as you may know Mansion and Garden Stuff will always be included in the UC version, so if you see that I accidentally used anything from that stuff pack, please tell me and I'll remove it! I used boolProp allow45DegreeAngleOfRotation true, setHighestAllowedLevel, setQuarterTilePlacement On and the Roof Angle Chooser tool. Those are cheats and features that were introduced in later expansions and I'm not sure how the base game would handle lots where these things where used on, so if anyone has an answer to that or is able to test it, please let me know! As I said earlier name suggestions for the lots are always appreciated! And lastly I obviously value your opinions and I would love to hear them! [*] I have The Sims 2 Ultimate Collection and used the AnyGameStarter for the UC to make sure I don't accidentally use stuff from expansions or stuff packs, but as you may know Mansion and Garden Stuff will always be included in the UC version, so if you see that I accidentally used anything from that stuff pack, please tell me and I'll remove it! It does not matter do you use anything from M&G, it will still reguire it, because of the game runs with M&G engine (SP what is actually kind of EP). Oh, really? Are you sure this applies to lots? I mean what would happen if one of those lots would be installed in the base game? I never heard of lots not being compatible with older versions, because of changes in the engine. That'd be really unfortunate! But thank you for pointing this out! I'll look into it! If installed into base only it would crash. Lots always require the EPs they were built with, because of the game engine, which is altered with each EP. This neighborhood will require M&G. It would be much easier to give feedback if you were to post more pictures. Keep in mind that CFF is for limited testing, not permanent content hosting. I am not sure how many non-UC players will have the base game with M&G as their only expansion pack - as far as I am concerned you can just as well use all the items from all the packs. (And, yes, the UC runs on the M&G engine). There are certainly enough players with the UC or with all the expansion and stuff packs on disks that can use your hood. There are also, as far as I am concerned, more than enough hoods available for base game only players. #6 7th Aug 2018 at 7:11 PM Last edited by Kunder : 15th Aug 2018 at 2:11 AM. Awesome idea!. I've never had an issue with Strangetown overpopulation, there are sub-hoods you can move Sims to, like "Downtown". Strangetown in my game, is a place where 80% or more, are Maxis Sims. I only introduce my CAS Sims, if I really need to. I also allow my Sims to age, and die normally (with few exceptions). This is so awesome! I can't wait to test this out! Not sure if this is still being updated, but it looks amazing!